Today was the Autumn Equinox, which some use to mark the beginning Fall. Where I live it was very hot and muggy, hardly autumn-like at all, and even the reasonable breeze could not budge the heat. I went bicycling with my son, promising him ice-cream, which he accepted as adequate exchange, and picked up cold sandwiches for our supper, but in-between I worked on the setting for this piece, yet another by Christina Rossetti. I wasn’t intending to return to Rossetti so soon, and I’m not sure how I ran into this poem, but it meshes so well with some others I featured here this month about summer and attitudes to love. I just couldn’t deny it. Going beyond the last Rossetti poem of longing we featured here, or William Carlos Williams with his observation of nature’s dispassionate summer, or Edna St. Vincent Millay’s notice of a missing summer muse of comfort in herself, this one is more distressed. The speaker is depressed and is showing her friends away—it’s a fairly pure piece of Victorian melancholia. Will her friends notice she’s not keeping her garden up and bring her round some tea and biscuits? One hopes so. I know little of Christina Rossetti’s life, if she suffered from depression, or if this reflects a more temporary mood; but in whatever case, she fashioned a finely crafted lyric to present the experience. I find this sort of thing often in English poetry, sadness that none-the-less sings in a lovely way. Here is America we grew up some Blues, and we tend more to bargain with despair, or call it names and begin to insult its absurdity. The title is a bit of puzzle to me, though. “From Sunset to Star Rise” has something of a “It’ll get better” connotation. Was she trying to remind herself of some wisdom that could come from this, or that there is some mystery yet to work out? Musically I wrote this on acoustic guitar and the full arrangement retains the acoustic guitar part with some disconsolate drums and slowly building synth parts. To hear it, use the player gadget below. < Previous He was so singularly great, they called him THE Lonious Monk! 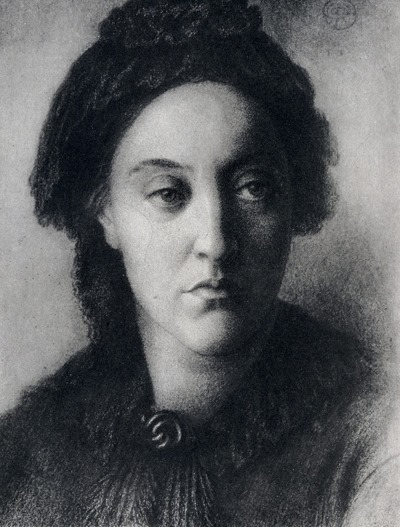 I was a bit rushed yesterday, but overnight I checked; and yes, as best as one can diagnose something over Internet and over a century ago, Christina Rossetti likely had depression. In that case tea and biscuits may be necessary, but is not sufficient.